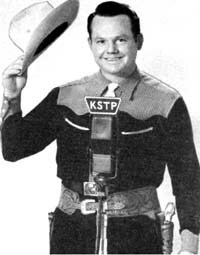 Stanley E. Hubbard, President and General Manager of KSTP back around 1943, told us in the "Deluxe Edition Favorite Songs KSTP Sunset Valley Barn Dance" that KSTP began a series of Saturday night broadcasts in the fall of 1940 that were known as the "Sunset Valley Barn Dance". 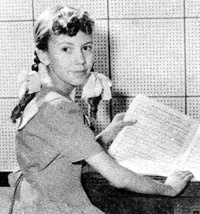 The idea was to bring to listeners, young and old alike, '...true American folk music in its original form'. 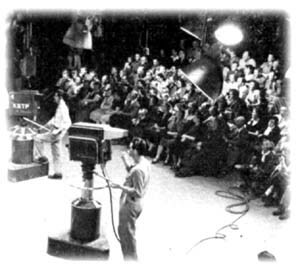 The show had staying power and our research has shown it lasted well into the 1950s. He wrote that hundreds of thousands of fans had attended the shows in the two and a half years it had been on. These shows featured songs of 'hearth and home', 'breakdowns and fiddle tunes', 'ringing banjo melodies', 'harmonica blues' thrown together with a dash of comedy for good measure. And well it should have been successful. 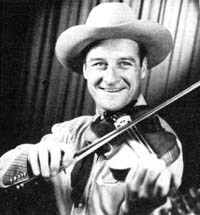 For the producer of KSTP's Sunset Valley Barn Dance was David Stone, who had previously served in a similar role on WSM's Grand Ole Opry. 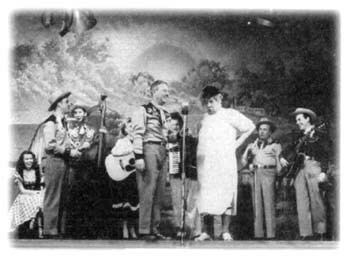 The show had it all and had performers of every type, much the way the early Opry started. Old-timers entertaining the audiences with their fiddles and banjos. The youngsters of the day did the polkas and schottisches. 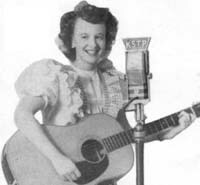 In an 1953 article in Cowboy Songs, they asked what made a 'Barn Dance' tick and they listed several ingredients of which the KSTP Sunset Valley Barn Dance had, too. First, there was the fiddles, the guitars and accordions not to mention a great deal of spirit, the love of the old-time music and an understanding and feeling why it lives on and on. "It's beyond me. I love to play'em and sing'em, and the folks still ask for them. That's enough." The show had a couple of notable fiddle players. 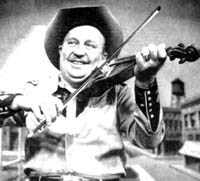 One was Fiddlin' Russ, who was born and raised on a farm in Minnesota. He said he could remember being held on his dad's lap as he fiddled into the night for the neighborhood gatherings for a barn dance. Another was Dusty Lane and the two of them would often get together for some twin fiddle magic. They tried to stay true to the old folk tunes of the past. But perhaps sensing that times were changing, noted that many of their artists were writing their own original tunes. 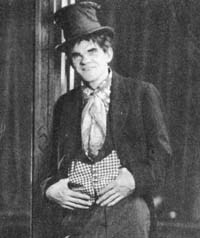 Noted personalities in the song folio were Brooks Henderson, Cal Karnstedt, Ben Leighton, and Jimmie Valentine. David Stone also produced the Sunrise Roundup on KSTP back then, too. And they said used his knowledge and experience gained at the Grand Ole Opry to help guide the shows. 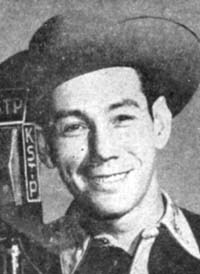 He was said to have revived the old-time dances and was credited to the square-dance revival in the northwest back then. Back then, KSTP was 1500 on your AM Dial, a 50,000 watt station. It was said to have an unusual directive antenna array that took the 50,000 watts and created a 133,500 watt night-time impact westward of the Minneapolis-St.Paul area to reach a broader listening audience. 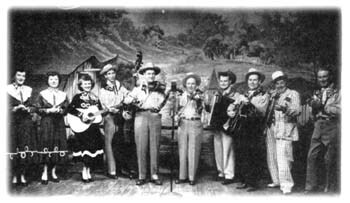 The talented cast of the KSTP Barn Dance in 1953 did more than just the Barn Dance show. They appeared twice a week on a show called "County Road 5" that featured visiting rural families. The other three days of the work week, they appeared on the "Mainstreet" program that featured hillbilly and western folk music as they called it then.